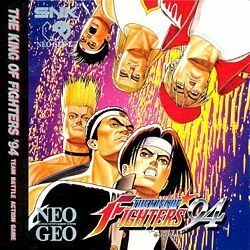 The King of Fighters '94 (officially abbreviated KOF '94) is a 1994 fighting game released by SNK for the Neo Geo arcade and home console. It is the inaugural game in The King of Fighters series by the same company. 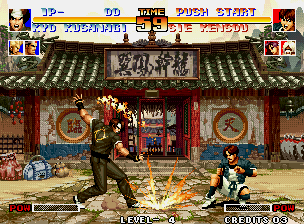 The game was originally ported to the Neo Geo AES and Neo Geo CD following its original arcade release. In 2004, to commemorate the tenth anniversary of the series, SNK released a remake titled The King of Fighters '94 Rebout, which featured the original game and a new version with high definition graphics. The basic gameplay of KOF '94 is similar SNK's previous games such as the the Fatal Fury series, Art of Fighting, and Samurai Shodown. The game uses a four attack button configuration similar Fatal Fury 2 and Fatal Fury Special consisting of Light Punch, Light Kick, Strong punch, and Strong kick. 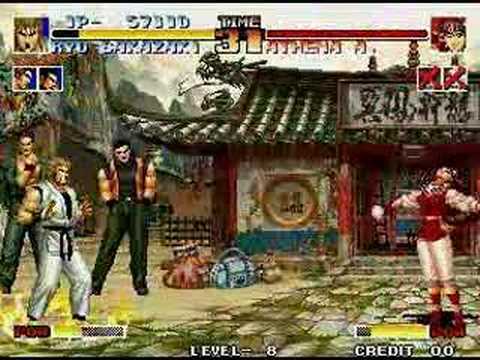 Like in Fatal Fury 2, certain specialized techniques can be performed by pressing certain buttons in combination. Pressing Light Punch and Light Kick simultaneously allows the player to dodge an opponent's attack, while pressing Hard Punch and Hard Kick will perform a character's "Bop Attack". As with other fighting games, each characters has set of basic, unique, and special moves that can be perform by the player with a combination of specific joystick and button inputs and combination. 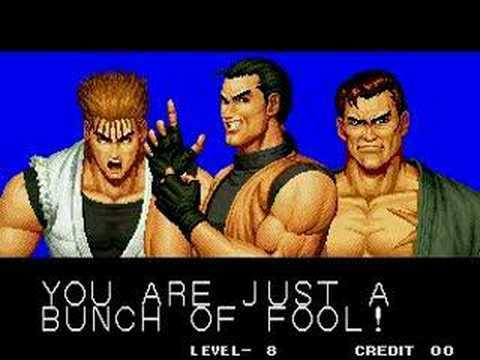 Instead of the traditional round-based format used in preceding fighting games, KOF '94 features a format consisting of 3-on-3 team based matches officially dubbed the Team Battle System. Instead of choosing a single character, the player selects from one of eight available teams, each representing a different nation (U.S.A., Brazil, Mexico, England, Italy, China, Korea, and Japan), each consisting of three members. Before each the match, the player and the opponent will then choose the order in which each member will enter battle. When the match begins, the members chosen to go first on each team will fight. When one character is defeated, the following of the same team will take his place, while the character on the other team will have a small portion of their life restored (if energy was lost during the previous round). If a character is losing a match against the opponent, then player can call one of their remaining teammates standing on the sidelines to jump in and attack the opponent. The match will end when one team has defeated all three members of the opposing team. The game is a one-on-one versus fighter in the tradition of Street Fighter II, but innovates well beyond the template Capcom established and creates a more dynamic and engaging scenario. The team approach is the most significant and obvious difference – though KOF is a one-on-one fighter where only two characters fight at a time, each individual character is always accompanied by two companions. At the end of a round of combat, the loser is eliminated from the match and one of his two buddies steps in to take his place, while the winner stays in play (and usually doesn't recover from any damage he's suffered so far). Each match can last to a maximum of five rounds, then, and a team isn't completely eliminated until all three of its members have fallen in battle. This is a system that other fighting franchises have since adopted and remixed, but the team approach was first born here in KOF '94. That's worth a tip of the hat.